After all the excitement of yesterday's Super Bowl, we thought it was important to shed light on some of the most common injuries football players experience. Unfortunately, no matter how much preparation these world-class athletes put in off the field, injuries do happen on the field. The high speed rushing combined with full body contact makes for a perfect storm in which an injury can occur. 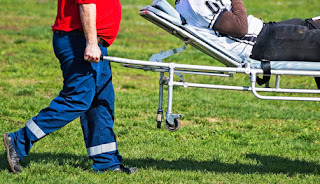 Concussions continue to be the most traumatic injury a football player can suffer. The NFL recently reported that players sustained 271 concussions in 2015, up 32 percent from previous year. Keep in mind these injuries are not just exclusive to the pros. If you, or your child, are playing a form of "Winter or Spring ball," or even flag football, make sure to train safely and smartly, rest as needed, and see a doctor immediately if you've been hurt.